MANILA, Philippines – Victims of human rights violations under the Marcos regime are one step closer to receiving reparation from the government. 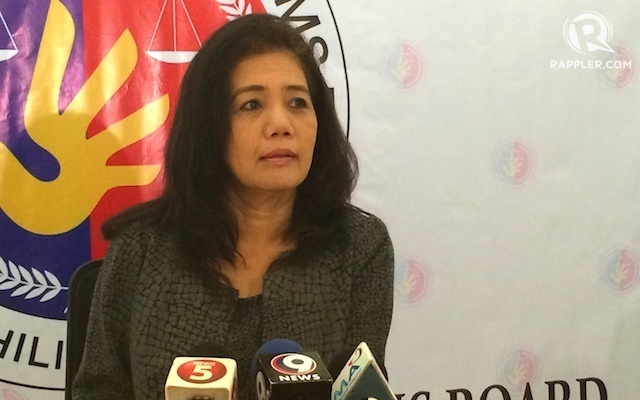 A total of 46,985 claims for reparation and recognition were filed before the Human Rights Victims’ Claims Board (HRVCB) as the application process ended Monday, November 10, its chairperson, Lina Sarmiento, said in a press conference Wednesday, November 12. This number is more than double what the board had expected and prepared for, Sarmiento said. The board is now preparing to evaluate and investigate the authenticity of the claims. Those who have not filed their claims can do so once Congress passes the joint resolution seeking to extend the application process for another 6 months. The House of Representatives has approved the measure on third and final reading, while said the Senate has given its assurance that it will approve the resolution on third reading when session resumes on November 17, Sarmiento said. The HRVCB is tasked to distribute the P10 billion ($222.52 million*)-fund plus accrued interest that was transferred to the government from a Swiss account holding the ill-gotten wealth of the late president Ferdinand Marcos. Republic Act 10368 represents the state’s formal acknowledgement of human rights violations committed during the martial law period. Under the law, individuals or their relatives who disappeared or were killed, tortured, illegally detained, and deprived of livelihood and properties by agents of the state during martial law are entitled to compensation. At the top of the board’s next agenda is weeding out claims from alleged fixers who may have taken advantage of the process, Sarmiento said. The team will also look into reports that some lawyers had advised their clients to file claims even if they were not actual martial law victims. “We are setting up an investigation team to evaluate the claims as well as reported fixers. This will be in cooperation with law enforcement agencies,” Sarmiento said. In verifying the authenticity of the claims, Sarmiento said the board will utilize analytics to classify claimants according to categories. They have divided work among 9 members into 3 divisions. Claims would be classified according to provinces or municipalities, families, and those who are already “conclusively presumed” to be legitimate claimants. Fact-finding teams would also be deployed to gather more information. This landmark reparation process marks the first time that a body is documenting in such a scale what really transpired during martial rule through the submission of sworn statements attached to the claims, Sarmiento said. The HRVCB has become a repository for documents from lawyers, non-governmental organizations, and civil society organizations who were active in documenting human rights violations during that the martial law regime. The board only has until May 12, 2016, to finish its work – from validating the applications to awarding financial compensation for the legitimate claimants. Commissioners aim to release checks for monetary reparation by December 2015. Sarmiento is calling on Congress to consider amending the law that limits the number of personnel they can hire to only 5 lawyers and 3 paralegal officers. For now, Sarmiento said the board, along with the Department of Budget and Management, has devised a “creative solution” to address the lack of personnel. One of these would to constitute the board tasked to create a memorial for human rights victims early so its members can help the HRVCB. With a tight schedule, there have been proposals to extend the deadline of the filing of claims for 2 more years. Sarmiento opposes this. “If you ask us about that proposal, we’re not in favor to extend because if you have seen all our claimants, they are old, they are sick….Some of them died already. But we will be creative in solving the problem,” she said.